An Elite Journey II: The First Task of Leadership is a sequel describing the main character, CJ Harding's journey of becoming his best self. While continuing to read from his late father's leadership manual, CJ expands his leadership through new teammates, coaches, and mentors. CJ also finds himself in the middle of a tragedy, which has caught the nation's attention. Ultimately, this is a story of a young man, who while striving to become an elite athlete, discovers just what is - the first task of leadership. "An Elite Journey II gets right to the heart of leadership. An important read for athletes and coaches." "Coach Massucci has taken a topic that everyone talks about, but few understand. This book clearly defines what leadership is all about. An Elite Journey II continues to show great examples of excellence demonstrated by the main character, CJ Harding. One can see just what it takes to go beyond one's comfort zone, both on and off the court. This is a must read for all coaches, parents, and players." "Coach Massucci captures the essence of team and commitment with this book. As a former collegiate player and father to a collegiate athlete, I highly recommend An Elite Journey II for team building and even a casual read for athletes. Great job, Coach." "Michael Massucci continues this uplifting leadership journey as CJ Harding fights through the pressures of high school and big time basketball. GREAT READ for all ages - read it with your kids - GREAT LESSONS to share." "An Elite Journey II brings to life the lessons that sport offers to today's coaches and athletes. Coach Massucci masterfully weaves the timeless principles of leadership into a fable that deals with many topics that are present in our society today. Thought-provoking and relatable this is a must read for coaches, players, and anyone working closely with our youth." 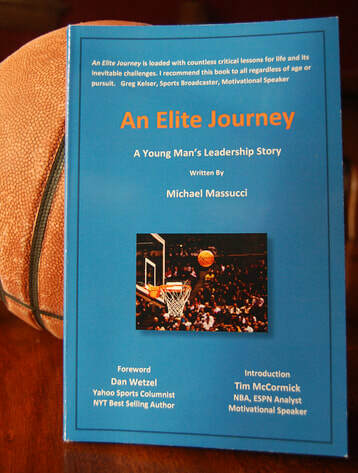 "Coach Massucci pens a great story in, An Elite Journey: The First Task of Leadership. This is a how-to leadership tale, continuing the adventures of CJ Harding. The lessons, ideas,and guidance in this fun read are the perfect complement to anyone working with our youth." "An Elite Journey II is an entertaining read and tackles many relevant and sometimes challenging topics that go beyond sports. Leadership, developing relationships, and applying life lessons are the pillars of this book. Ultimately, as coaches, these are the things we hope our student-athletes attain over the course of their careers ." "An Elite Journey II is not only a great story, but it's a fantastic blueprint for leadership and high-character. It's heart-felt, relevant, and truly inspiring. An absolute must read for every student-athlete." "In reading An Elite Journey II, I found myself more than reading - I found myself, "present in the moment". I was right there in the travels of CJ and the Avengers. There are so many powerful lessons; I can't wait to share this story with my older grandchildren. Thank you, Mike." "The best young players and coaches are enthusiastic students of the game. An Elite Journey II, by Coach Massucci, is our next lesson. We need more stories like this, lessons about more that just basketball. So thank you for another lesson, Coach, and please keep them coming." "An Elite Journey II is built on a solid foundation of quality leadership principles that challenge today's student-athletes. Coach Massucci confronts and captures these challenges. The questions at the end of each chapter provoke further analysis, making this book a must read for team that value culture and character"
An Elite Journey: A Young Man's Leadership Story is a coming of age story of a young athlete and the lessons he learns playing the game he loves. Though this story is fictional, the story line and many of the characters are based on Coach Massucci's 20 years experience of coaching varsity basketball. He continues to inspire his players and 3 sons with the West Point motto of "choose the hard right over the easy wrong." "The lessons on character, resilience, humility, work ethic, grit and, most importantly, leadership are timeless. Coach Massucci provides any parent, teacher, coach or counselor who wishes to teach the crucial inner-qualities of character and leadership necessary for success a perfect vehicle to do so. Elite Journey is a must read for those who understand the importance of character and leadership." "Just when we needed it, Mike Massucci delivered a book that needs to be read by all kids and coaches at the grass roots level of basketball. If I ran a youth program I would require all my coaches and kids to spend the time to get to know CJ Harding and his journey. It was a refreshing read, and a powerful story that integrates old fashion values into today’s life. " "A must read to prepare student-athletes for their lifetime journey! An Elite Journey will change a student-athlete's life trajectory." "As a media specialist I am constantly on the look out for quality reads that will particularly appeal to young males. Mr. Massucci has managed to generate a story that will not only attract the attention of this sometimes hard-to-reach group of readers, but also slip in some important life lessons as well. Educators should definitely consider including it in their classroom and school libraries." "An Elite Journey is an entertaining story of resilience, perseverance, and triumph. With sports as the backdrop, An Elite Journey is loaded with countless critical lessons for life and it's inevitable challenges. I recommend this book for all regardless of age or pursuit." "An Elite Journey is a fantastic book, a great story woven full of important life lessons and advice for young people. I wish I could have read this at 15 instead of 28, but the story resonated just the same. An absolute must read for every high school athlete." "Coach Massucci's book teaches young people the incredibly important skill of setting and achieving goals. While reading this book I constantly found myself relating to the leadership and life lessons CJ learned to my own, as a former athlete and as a Cadet at West Point. This book is not only great for young athletes, but for all young people who want to be successful."